1 Place duck breasts, skin-side down, in a non-stick frying pan over low-medium heat and cook for 4 minutes or until golden and crisp. Turn and cook for another 5 minutes or until medium-rare. Remove to a plate, cover loosly with foil and stand for 5 minutes, then thinly slice. 2 Cook soba noodles in a large saucepan of boiling salted water for 4 minutes or until tender. Drain, rinse under cold running water until cool, and drain well. Place noodles, green onions, sesame oil, sesame seeds and soba sauce in a large bowl and combine well. 3 Heat peanut oil in a small frying pan, add scallops and cook over high heat for 1 minute each side, or until golden. 4 Divide noodle mixture among bowls, top with sliced duck breasts, then place scallops around edge, scatter with furikake and serve. 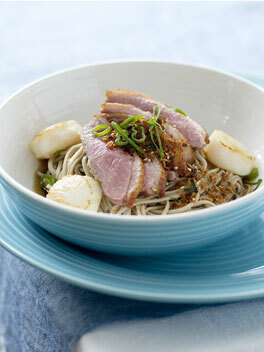 Note: Soba sauce is a refined soy sauce seasoned with bonito flakes. Furikake is a Japanese seasoning mix of bonito flakes and nori. Both are available from Japanese or Asian food stores.